VoltStorage’s vision is to make renewable energy available 24/7 and to bring clean power to every part of the world. Therefore they developed a smart device that enables everybody to store the collected solar power from the rooftop during the day in order to use it at night. The VoltStorage battery (size of a fridge) is set up at your home, where the electricity is produced and used. With a novel Flow Battery Technology, VoltStorage can achieve the most competitive price and set the highest safety standards for electricity storage in the market. The most important characteristics are the high number of cycles (10.000+) and no degradation of capacity or power output over time. These features qualify the device for further applications without affecting the core purpose of it: storing solar power. 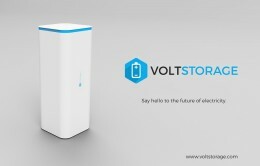 By connecting the single devices over the internet (encrypted connection) with a server-based platform, a virtual power plant – the VoltCloud – will be formed. The VoltCloud will allow to rent out unused capacities to utilities as well as to provide regulating power to transmission system operators. The intelligent connection of the devices will help stabilizing the electric grid and allow to offer the VoltStorage to an unmatched price.